Sometimes I walk in to a project that seems like it just can't be finished...yet. For example, earlier this week, I was helping a new home owner unpack and settle in to her new place. We started with the kitchen, which was spacious and appeared to have more than enough room to store her dishes, pots and gadgets. The kitchen included a large pantry to house all the food items, as well. However, a couple boxes in, we realized something. Some construction was still going on in the home - just little things. Knobs being added, switch plates screwed on and a couple doors to attach were still on the to-do list. Unfortunately, this included the shelving to go in the pantry. Now, I don't know about you, but I love food. Eating it. Preparing it. And, I'd like to think my client would also enjoy having access to her food stuffs. So, I improvised. We had plenty of packing boxes that would otherwise just be broken down and taken out to the alley to recycle. So, I made them into temporary storage cubes. While unpacking, we also found a couple stacking shelves from the previous home that were no longer needed anywhere in the new home. They fit perfectly in between the stacked boxes. They also provided some support for the cardboard on the sides of the lower boxes, making the entire system a little more reliable. No need to go out and purchase something for a temporary fix. 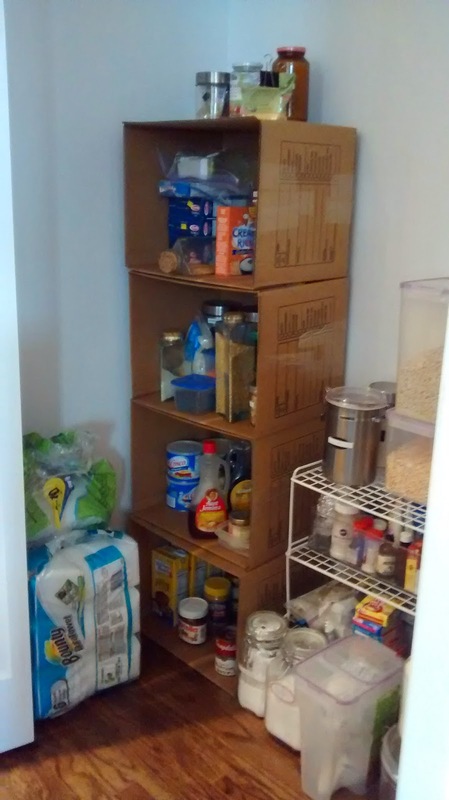 No need to leave all the food just stacked on the floor or still packed away in boxes. 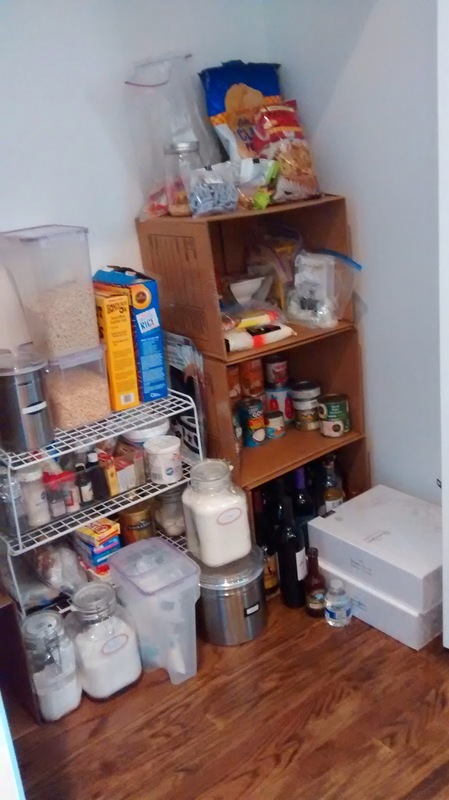 And, in the long run, it allowed my client to get a better idea of what categories of food for which she will need permanent storage in the pantry. The good news is, she'll still have more than enough space to store what she wants.